On October 12, 2005, at the age of 71, Jackie Gothard saved a historic New Orleans congregation. One month earlier, the Beth Israel Synagogue in Lakeview was destroyed by floodwaters, leaving the congregation without a home. Jackie knew that celebrating Yom Kippur together was essential to Beth Israel’s survival, and might save a century of history and tradition. Through countless hours and tireless effort, Jackie secured everything the 101 year-old congregation needed for the ceremony. And they literally needed everything…including a rabbi, a Torah and a temporary synagogue. Beth Israel’s Yom Kippur service took place on October 12 in a Kenner hotel meeting room — a very different service than the congregation had come to expect after so many years in their beautiful home on Canal Boulevard. Everything was borrowed: the rabbi, the chairs…everything. Hurricane Katrina had taken it all from them. While the service itself was not very elaborate, it was a rich, deeply moving experience, which underscored the true meaning of congregation. Beth Israel was the only Gulf Coast synagogue completely destroyed by the storm. Closing down Beth Israel would have been logical; its members could have dispersed among the other area congregations. But logic doesn’t consider the overwhelming importance of history, community and tradition. Jackie Gothard remembered this while collecting the only items salvaged — memorial nameplates of those who supported the synagogue over the years…those who called Beth Israel their spiritual home for more than 100 years. Was it over? Would the next generation be excluded from this tradition? Jackie then resolved that Beth Israel must survive. The value of tradition is not obvious when we’re young. Only through life experience do we truly come to recognize the purpose and significance of honoring and continuing the legacy of those who came before us. 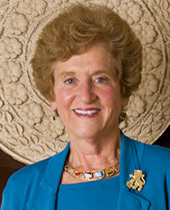 Now future generations can thank Jackie Gothard for keeping Congregation Beth Israel alive. Jackie Gothard … Peoples Health Champion.